A long time ago Amazon introduced us to the Amazon App Store and the Amazon Free App of the Day. In the beginning I would check every morning to see what the latest and greatest app was that I could get for free. After a few weeks I became jaded and checked less and less often. Every once in a while there would be a rare nugget but it seemed like the majority of the apps being put up weren’t worth my time. Today I happened to randomly pull up the Free App of the Day. Today’s app was an app titled “Starlink” by Tasharen Entertainment. It normally sells for $1.96 USD. At first glance it shows what appeared to be glowing stars with lines going between them and random space features drawn in around the glowing stars. I read a few reviews and decided to give it a try. I downloaded the game and was quickly impressed with its simple and easy to understand interface yet its deep and well thought out concept. The game is a real-time strategy game taking place in randomly generated space maps. You pick a team, red or green, and are given a homeworld. 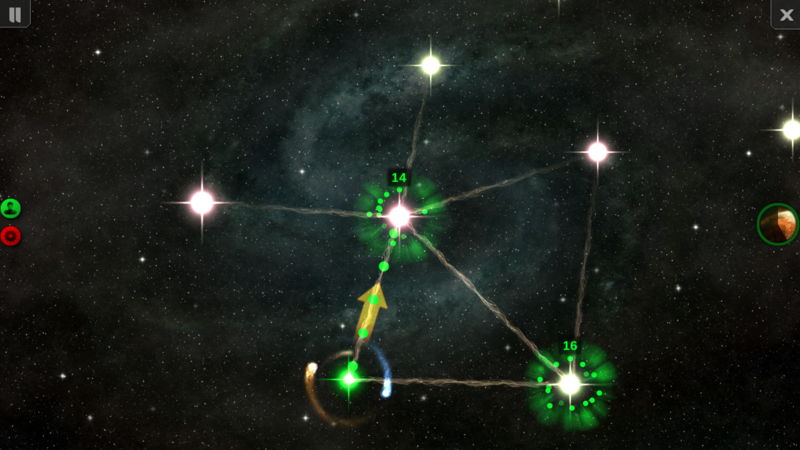 You then send the starships your homeworld automatically creates with a simple swipe to another planet. Your starships then go to the other planet and slowly subjugate to your rule. At the same time you are taking over planets you have an enemy, or enemies, that is doing the same thing. You then duke it out until either you or your opponent are eliminated. At the beginning of the game you are given the option to select abilities that influence how quickly you can take over other planets or how well you defend the planets you already own with other various abilities. When conquering planets you discover that some of them are affected by their environment to give you bonuses or handicaps specific to that planet. All in all this app was a hit with me and I have thoroughly enjoyed testing it and out and will be leaving it on my tablet for some time. I recommend you all get it and try it out yourselves! It’s A Party In Hearthstone’s Latest Expansion, One Night in Karazhan!